The Newcomers Club of Greater Charlottesville, VA is an all volunteer social club offering a wide range of activities and events for those new to Charlottesville or experiencing a new stage in life and interested in meeting new people. Weather Policy: If the Albemarle County Schools are closed due to bad weather, any Newcomers Club activity scheduled for that day will be postponed or cancelled. The Charlottesville Newcomers Club offers an exciting variety of activities and events. Among the possibilities are club-wide Hospitality Events that are popular with singles and couples; four Book Groups; several Bridge groups; monthly Coffees, Teas, Dining, and Socials in members' homes; Community Outreach opportunities; activities that are Especially for Men; an assortment of groups devoted to Hobbies and Interests; and groups for Singles. Newcomers Club members are also welcome to join our Charlottesville Newcomers Club Meetup group, where we can arrange impromptu social events to share. Click here to learn about our Meetup group. Find out more about all of the Newcomers Club activities and events below and check out the Newcomers Club Activities Calendar: April and May. Mysteries, suspense and thrillers—are those the kind of books you love to read? 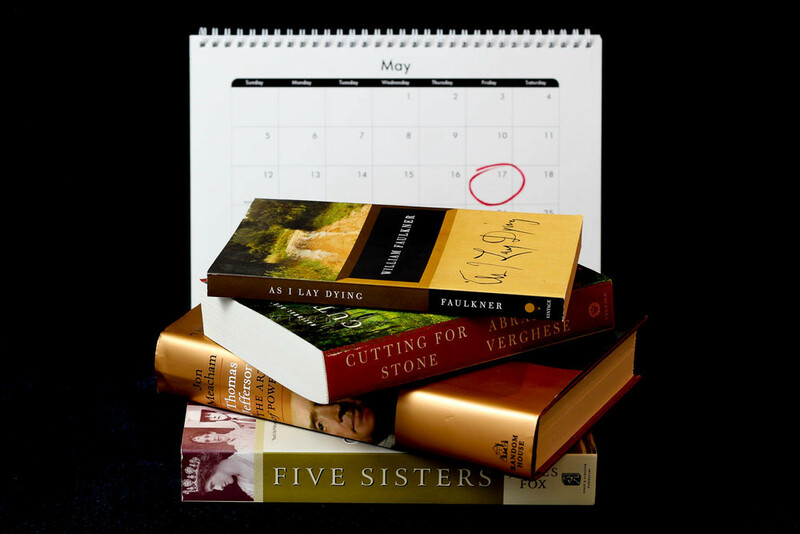 This book group meets on the 4th Monday afternoon of the month to discuss authors, books and series of this genre. The Men’s Nonfiction Book Group focuses on science, history, culture and politics. Scholarship and in-depth research are particularly valued. The group meets September through June on the 4th Wednesday of each month at 7:30 p.m. at the Fontana Club House located off Rt. 20 N in the Fontana community. A friendly Intermediate Bridge Group meets every 1st and 2nd Thursday of the month at Glenmore Country Club. Players gather at 10:00 a.m., play about 12 hands, enjoy a luncheon, then resume playing until mid-afternoon.. The Wednesday Bridge Group meets at 1:00 p.m. on the second Wednesday of the month. The group plays friendly Contract not Duplicate Bridge and scores Chicago. This group is low-key and always enjoys having new members join. Any two people as a pair can play, and singles are welcome as substitutes. Social Bridge meets on the third and fourth Wednesdays of the month at The Independence in Pantops from 1:00 to 4:00 p.m. to play cards in an easy-going atmosphere. Beginners or experienced bridge players are welcome! Teas are held monthly from September through May at members’ homes or at locations in the Charlottesville area. Teas usually occur on the third Monday of the month. Coffee Break is an informal monthly get-together of Newcomers and guests. It takes place the first Friday of each month from 9:30 to 11:30 a.m. at Newcomers members’ homes throughout the Charlottesville/Albemarle area and is a great way to get to know new and longtime members of the organization. Gatherings typically attract from 10 to 30 participants. There is no fee and no need to attend every month. Every fourth person to RSVP is asked to provide something for the refreshment table. Dining In holds dinners monthly in members’ homes and welcomes both singles and couples. Dinners normally occur on the second and/or third Saturdays of the month. The host provides the entrée and a side and the guests bring the appetizer, salad and dessert. Groupings of diners are formed the last week of the prior month. This is not a gourmet group, and members host a dinner once or twice a year. A great opportunity to get together every month to renew old friendships and make new ones! The attendees gather in a newcomer’s home for a few hours of wonderful conversation. Each couple or single who attends brings a finger-food appetizer to share and a personal libation if so desired. The Outreach/Service Committee coordinates volunteer opportunities that generally can be completed in a day. The opportunities may be announced in the newsletter and/or posted on our Meetup website. Members of Newcomers can choose to participate as they wish. Volunteer opportunities are in various areas and occur at different times depending on the needs of the organizations we support. Some of these organizations for which we have volunteered include: Shelter for Help in Emergency, Computers4Kids, Area food pantries, ToyLift, ReadyKids, UVA Hospitality House, and Festival of the Book.. The Men’s Breakfast meets on the second Thursday of every month at 9:00 a.m. at the IHOP in the Rio Hill Shopping Center (1740 Rio Hill Center, Charlottesville, VA 22901). A private dining room is reserved. Members pay separately for their meals. At the breakfast, members are encouraged to lead discussions on topics of general interest or to talk about memorable life experiences. Occasionally the group takes day trips to points of interest within a two-hour drive of Charlottesville. In recent years Men's Breakfast members and their spouses have visited the Marine Corps Museum, Appomattox Court House, The Greenbrier Resort, James and Dolley Madison's Montpelier residence, Woodrow Wilson's childhood home, the Insurance Institute for Highway Safety, Tredegar Iron Works, Virginia State Capitol, Poplar Forest, D-Day Memorial, Virginia Air Museum, Udvar-Hazy Air and Space Museum, and the North Anna Nuclear Power plant. Bunco is an exciting and fun-filled game played with rotating teams. Join this new group now forming. A social dice game—no skills needed, only Lady Luck! A fun form of rummy that has been around for many years. Perhaps you played when you were children or with a grand parent. A social afternoon to enjoy with people who like a light-hearted card game. Come join our group, meeting on the fourth Friday of every month! Make Saturday night game night! Singles and couples are invited for fun with friends old and new the first Saturday of the month at a member's home. Participants bring a game or two from home and teach others how to play. We will form groups to play various games. During the evening we will take a break, socialize (of course! ), and then try a different game. No green thumb necessary - just a love of plants, gardens and gardening! Together we'll enjoy visiting beautiful public gardens, learning about our native Virginia plants, design tips for different kinds of gardens from pots to acres, seasonal displays, easy maintenance ideas, living with wildlife and the always popular annual spring plant swap. Each month a group ventures out to an exciting Charlottesville area destination plus enjoys lunch at one of our many interesting restaurants. Check the newsletter each month to see what has been chosen for the next exploration. Members meet the 3rd Thursday of every month, September through June from 1:00 to 3:00 p.m. at members’ homes to share ideas, work on projects, get help or instruction, admire others’ creations, and enjoy chatting. Members bring sewing, knitting, crocheting, needlepoint, drawing, painting, scrapbooking, greeting cards, beading or any other creative project they are working on or would like to start working on. The Charlottesville Newcomers Club Singles Meetup Group, at meetup.com/cville-newcomers-club-singles, enables single members of the Newcomers Club to create and participate in meetups which may include activities such as attending a movie or play; dining out; visiting a winery; hiking; walking; attending art shows, crafts fairs, sporting events, and garden tours; shopping trips; dancing; playing games and sports; participating in holiday dinners, etc. Enjoy a drive out to Keswick for April’s luncheon at Glenmore Country Club.